This fascinating story about Brixton’s legendary gay community of the 1970s was posted up on the urban75 bulletin boards, and thanks to the author Ian Townson, I’m now able to repost an illustrated version, giving a wonderful insight into a long lost part of Brixton life. 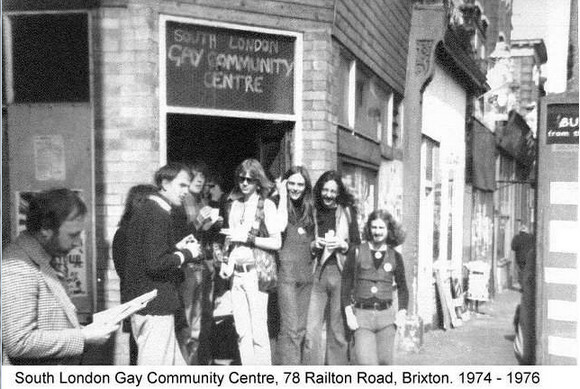 The South London Gay Community Centre at 78 Railton Road, Brixton, was squatted by people who were determined to come out into the clear light of day with a public statement of gay identity. It was the first of its kind and for two hectic years of ‘fits and starts’ the Centre established an undeniable and irreversible presence of gay people in the area. 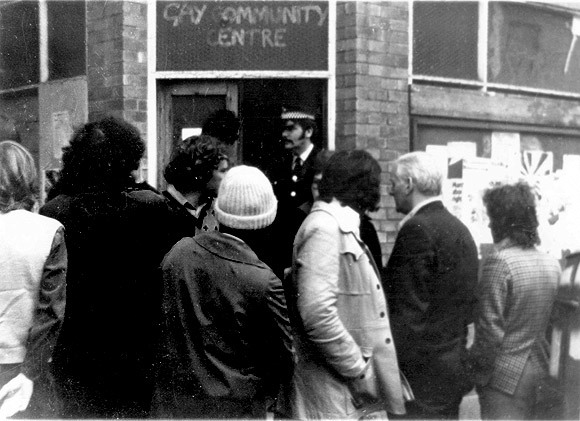 During the short period of its existence the Centre acted as a focal point bringing together gay people from many different backgrounds through social activities and political action. The Centre also acted as a magnet attracting people into the area who squatted several back-to-back houses on Railton and Mayall Roads with a shared garden in between them. 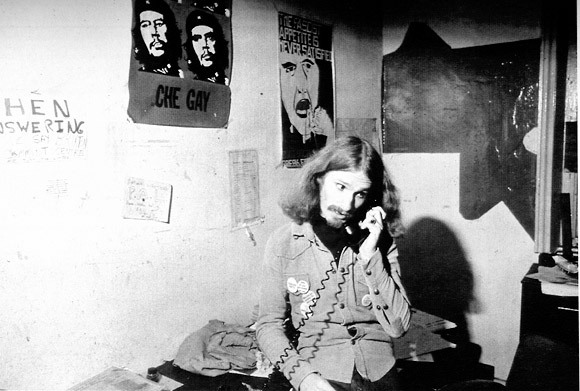 This became the nucleus for further political activity after the closure of the Centre but equally it grew, over time, as an experiment in new communal living arrangements for gay people with varying levels of success. Germany. I don’t know their names. Second row L-R Paul ?, Malcolm Greatbanks, Edwin Henshaw, John Lloyd, Ian Townson (what was I wearing? ), Stephen Gee peeping out from behind Edwin and Terry Stewart, Gerry Comey in the first row. Brixton was one of the most deprived inner city areas in London with high levels of unemployment and crime, a chronic shortage of housing stock with many dilapidated buildings left empty, large-scale environmental decay and blatant racism in an area with a large, young black population. Into this cauldron of deprivation leapt a number of different groups in and around Railton Road to challenge the poverty and decay in people’s lives. 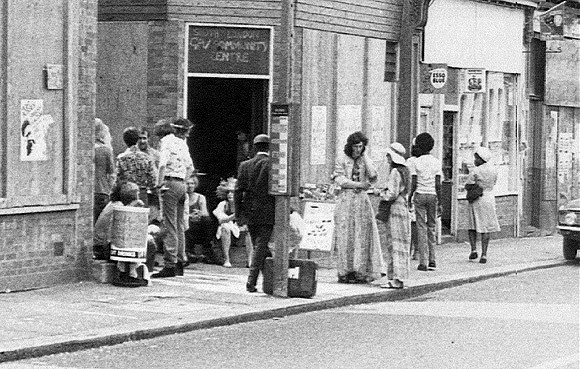 There were two women’s centres on Railton Road, an Anarchist News Service, Squatters Groups, a Claimants’ Union for those on welfare benefits, the Brixton Advice Centre, Icebreakers (a gay liberation counselling group), the Race Today Collective and a food cooperative in nearby Shakespeare Road and Atlantic Road. There was a wrestling group in the basement and, to counter the ‘macho’ posturing of the group, a sewing bee and knitting circle was formed in the upstairs front room run chiefly by Alistair Kerr and Malcolm Watson. We participated in the local and general elections in 1974 with Malcolm Greatbanks, Alistair Kerr and Michael Mason as the candidates. Being against Parliamentary Democracy as a meaningless sham it was pointed out that we were just doing this for the free publicity. 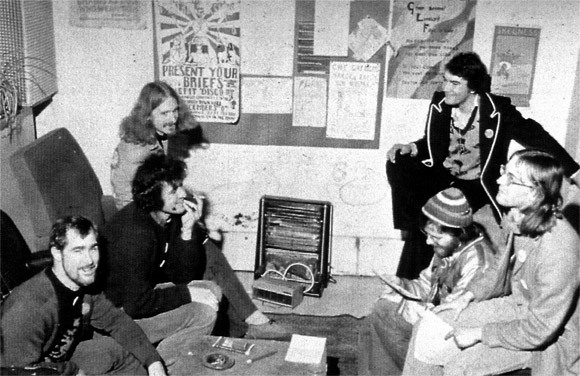 There were weekly discos in the basement, individual counsellors and regular meetings of the Centre ‘collective’ to determine which campaigns and social events we would support and be involved in. Besides all of this there was a regular duty rota so that all the people who visited the Centre would be greeted and made welcome. 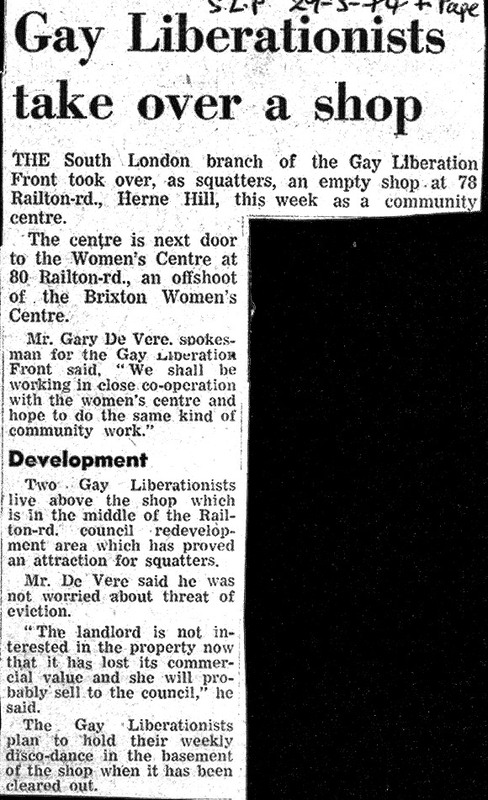 The 1976 Gay Pride event was also organised by Brixton Gays. It is possible to convey some of the atmosphere of ‘communal’ living in photographs of the gay squats that sprang up around the Centre. The kitchen more often than not became the hub of food, conversation and play. In the shared garden people would gather to dine Al Fresco or play music or even rehearse for various theatre productions. Even just camp it up for the hell of it. The gay squats eventually became part of the the Brixton Housing Co-op in the early 80s and were redeveloped into single person units. While this made for more secure accommodation and the shared garden was kept in tact it led to a more ‘privatised’ existence and some of the original elan and spirit was lost as a result. We even took tables and chairs out onto the street in front of the gay squats for a celebration party – some people in drag – getting a mixed reception from people on the steet. Some hostile, others indifferent, some amused. 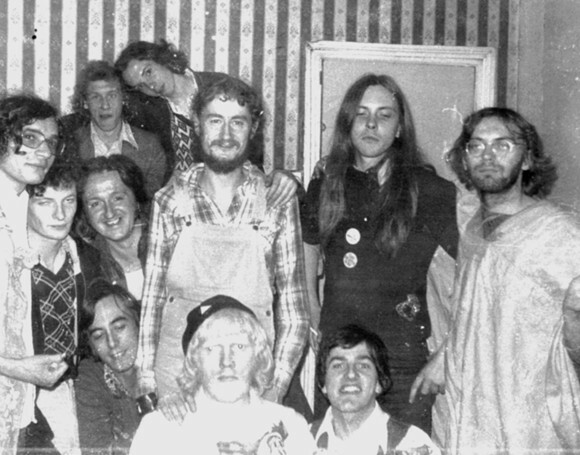 The South London Gay Liberation Theatre Group, which later became the Brixton Faeries, produced several plays, sketches and street theatre performances. They were mostly unashamedly agit prop but later became more sophisticated with better characterisation and plotting. Beginning with a Gay Dragon paraded in a local street festival the group went on to perform sketches for local community groups. Most of the productions were at fringe theatres or community centres and one performance of ‘Out of it’ was in front of the Young Communist League who were shocked to see two men kissing on stage. We picketed several pubs that we had been thrown out of in and around Railton Road for kissing and cuddling two of which, The George Hotel and The Windsor Castle, were burned to the ground during the Brixton riots in 1981. The George Hotel had previously been prosecuted under the Race Relations Act for barring black people. 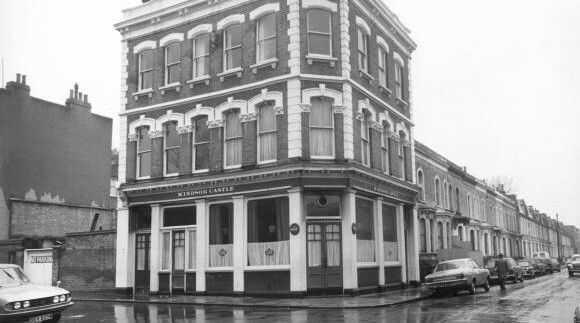 The Windsor Castle on Mayall Rd. Queens in Furs refused to pay local rates because none of the rates were used to provide amenities for gay people. The fur coat wearing was another way of gay men challenging rigid masculine identities. Those who refused to pay rates were summoned to Camberwell Magistrates’ Court where the presiding judge had difficulty in persuading the plaintiffs that they should ‘know their place’ and behave accordingly. Gary de Vere was thrown out for polemicsing out loud and our arguments were rejected. We lost the case as we thought we would but publicity was gained as a result. 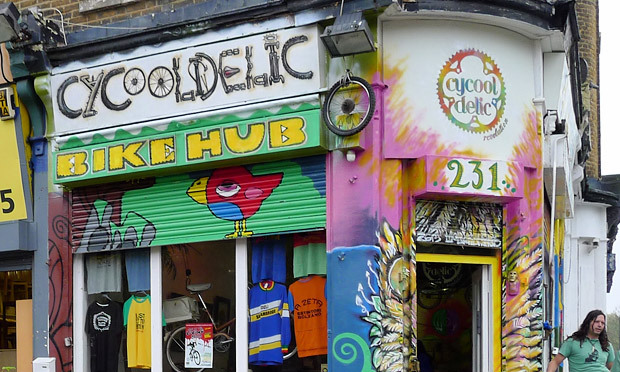 We insisted that the Centre should be publicly funded as a right and applied to Lambeth Council for a grant rather than scraping pittance money out of our pockets for general upkeep and paying the rates. The grant was refused. It was argued that the Centre should be privately funded despite the council granting money to other groups in the area. 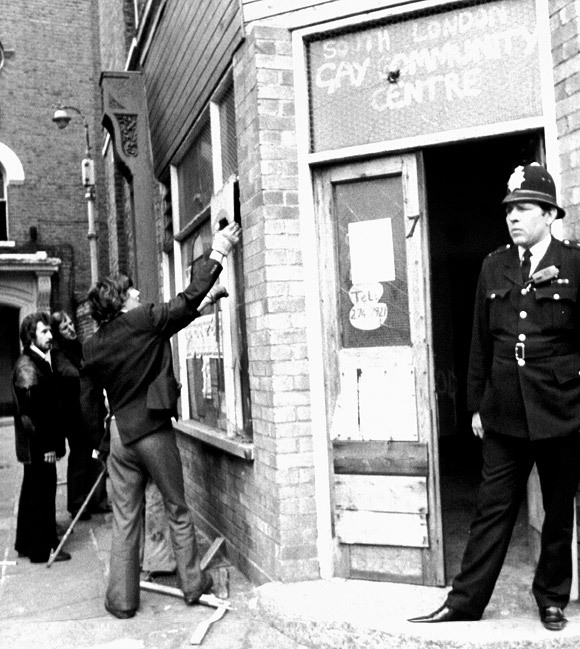 Bailiffs and police evicting the South London Gay Community Centre at 78 Railton Road, Brixton (April 1976). 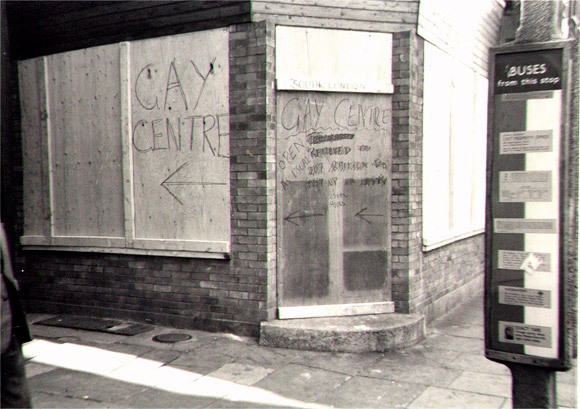 Many people who used the Centre were unemployed and could not afford to fund it. Infighting between different factions and lack of funding contributed to the demise of the Centre. 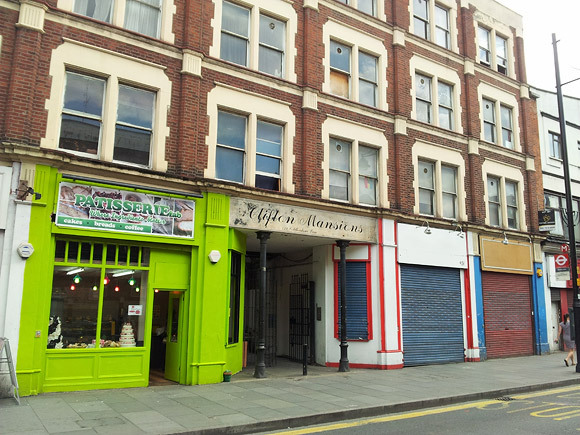 However the final blow came when the Centre was evicted by police and bailiffs so that the private owners could take vacant possession of the property and sell it to Lambeth Council for redevelopment. Thus bringing to an end the first public and visible institution with a clear gay identity. With this closure the focus for political and social activity shifted from the Centre to the gay squats. Police, workmen and bailiffs arrive to evict the South London Gay Community Centre with some gay people present to object. Jamie Hall, Colm clifford and Alistair Kerr (I think) on the left. 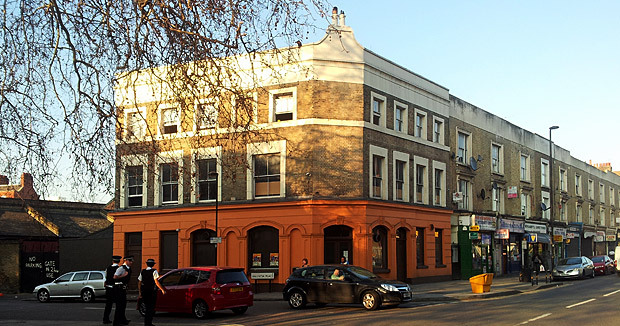 The National Gay News Defence Committee was originally based at 146 Mayall Road and then moved to 157 Railton Road with Stephen Gee as one of the main organisers. The group was set up when Mary Whitehouse, a right-wing moral crusader, prosecuted Gay News on a charge of blasphemous libel for carrying the already mentioned poem by James Kirkup. 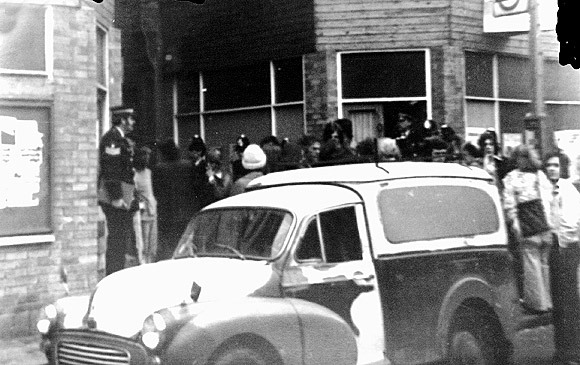 Workmen preparing to board up the Gay Centre after the eviction with a gormless looking copper standing guard. We moved back in once it had been sealed up. April 1976. This happened at a time when there was also much police activity against gay people in different parts of the country on cottaging charges and the wrongful assumption that we were paedophiles. With the successful prosecution of Gay News the NGNDC became the Gay Activists’ Alliance and continued with both national and international campaigns with many locally active groups. Also the fascist National Front was particularly active at this time; mostly against immigrants, black people and left-wing organisations but also several gay establishments had been attacked by them including the Vauxhall Tavern in South London. A special mention should be made of the Union Place Community Resource Centre in Brixton which encouraged us to go along and make posters, diaries, badges, calendars and banners for our campaigns. Ian Townson and Colm Clifford from the gay community became employees and Colm initiated ‘Homosexual Posters’ from there producing pictorial biographies of gay people and even gay Christmas cards. There’s a long running and fascinating thread our bulletin board thread – The Brixton Fairies: 1970s gay squat. Contributors include many former activists and residents. There’s another detailed personal account from Felix Alvarez in the thread as well as an article from 1978 by Brixton Faerie, Terry Stewart and a contribution from the gay rights campaigner and BBC6 DJ, Tom Robinson. If you have your own memories of this gay community – or any photos you’d like to share – please post them on the thread, add them here or send us a message. 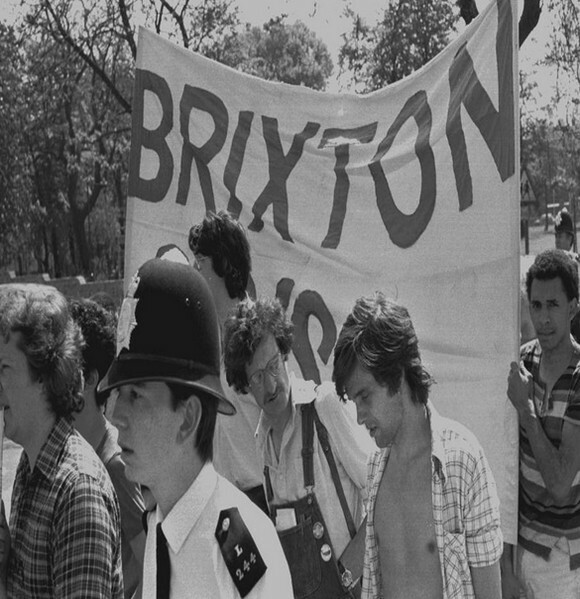 Update: Brixton’s radical gay past: the Brixton Fairies, the fight for sexual equality and Julian Hows’ London Transport skirt. (*Thanks again to Ian Townson for this article). Thanks Mike. Given all the photos and text I threw in your direction you have done a fantastic job. Well done. I’m sure it will raise a lot of interest and contribute to a history of Brixton in revealing what would otherwise have been a ‘hidden’ aspect if it had not been for this site and our efforts. Unfortunately the text I supplied is a bit threadbare. It was designed to fit in with the photographs and illustrations. Hopefully we will get people contributing to fill in the gaps and correct any errors on my part. One point about attribution. All the material I sent to you was originally in my possession. However I deposited it at the Hall-Carpenter Archive based at the LSE. I thought I would give them a plug. I realise you have been very busy and it has taken you quite some time to put this together but one again thanks for your Herculean efforts. Hello I am a nephew of Malcolm Greatbanks (RIP) and was blown away by the photo of my uncle in this post. I was born in 1972 and this era of my uncle’s life isn’t well documented to me, although we used to talk regularly from the late 80’s up to his passing. His Dad (my Grandad) basically disowned Malcolm for a considerable time, finally reconciling fully at his Mum and Dad’s Ruby Wedding anniversary c1986. I’d love to know if you have any more photos or stories regarding my uncle. It was very interesting to read of his involvement in the ’74 elections and of the group as a whole. Thanks for this insight. I realise I’m posting on an old topic, but thought it was worth a try! Hi Andy. I found this blog yesterday while trying to get up to date information on your uncle Malcolm. I was saddened to read your post that he has passed away – please accept my (very belated) condolences. Malcolm and I were friends at Queens’ College, Cambridge, where we shared rooms in our 2nd year – 1965/66. Around that time, me and my girlfriend visited him at his family home in Manchester. We were made welcome by his mum and dad, and I think we met his sister – your mum? The last time I saw him was in London in 1968 or 69, but we lost touch after I emigrated to Canada in 1969. I was glad to see his familiar happy, smiling face in the photo above at Mayall Rd. Your uncle Malcolm was very smart and a good, kind man. Given all the photos and text I threw in your direction, Mike, you have done a fantastic job. Well done. I’m sure it will raise a lot of interest and contribute to a history of Brixton in revealing what would otherwise have been a ‘hidden’ aspect if it had not been for this site and our efforts. Thhat was a very well put together reminder of yesterdays Gay Community. Here is a piece I wrote which is an overview of what was going down for us in Brixton at the time. That is Pride worth celebrating, worth fighting for, worth remembering and worth gold dust nearly forty years later. I wouldn’t change it for the world you hear me say. I would’nt. Thanks for that really good article. Here is an overview which I did a number of years ago, might still be on the thread somewhere. We are a couple of gay film-makers who live in the Brixton area and we would like to do a documentary about this amazing story! The Gay Centre did not close due to eviction. We re-squatted the next day ! It closed after the principal people involved gave up the struggle with those we rudely called “The Nerds” who took over but were so un-together that they failed to pay the electricity and phone bills and and within months,it had collapsed. Well said Bill I remember it well. I arrived with Michael Kerrigan and never looked back. I also remember the nightly attacks when the Youth Club finished and the mad machette man who I think was Greek and a closet. I remember the Tea dance we had on the street and then all getting arrested and ending up in Brixton Police Station. Great to see this coming together – thanks to Ian for his long-time work on collecting and collating what would otherwise be lost history (so moving to see pix of diamond-studden Alis, Gary Devere, Colm Clifford – and my mink friend John Lloyd amongst others). And, in effect, for helping us all to ‘find’ each other again. I ended up going to the Middle East in 1978, and tried many years later to find you all. Only to, sadly, discover so many friends had passed away. You don’t know how much I learnt from the GLF/Gay Centre experience. Lessons learnt in all kinds of ways that helped me to start up a gay rights movement in Gibraltar which, after almost 12 years of work, is now beginning to bear fruit. Thank you to all of you for the friendship, solidarity, and warmth I received at what, looking back, was a very tender and ‘needy’ moment in life. One which I hope you will agree is possibly the biggest contribution this moment in time gave us all. Very interesting – a group and scene that I knew nothing about, before finding this page via a posting on Metafilter. What a courageous, resourceful group of guys – I’m a generation younger, and grateful to live in the world that you helped to make (and especially, as a guy who has never had much interest in “macho” activities, in the world that people like Alistair Kerr and Malcolm Watson helped to make.) Thank you. Googled you, Ian Townson, and found this site. Just been going through boxes of ephemera, and found a poster of Brixton Faeries in Gents – my only thespian appearance I think! 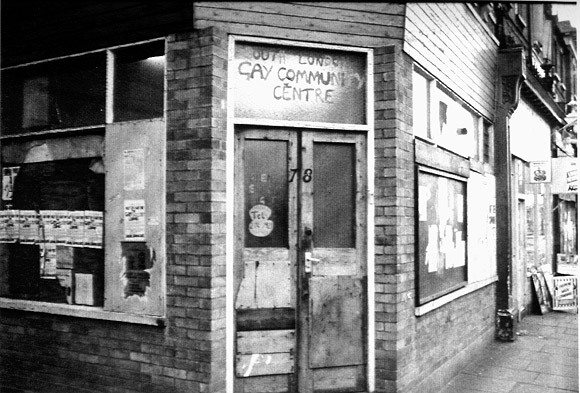 The Gay Community Centre was a tremendously important part of my coming out and coming together, it helped me make the links with other oppressed groups. I was a bit in awe of these wild, outrageous people at first, until I found the courage to do my thing, and have never looked back. Great work, and such an important part of our collective history. visiting you in Brighton and staying overnight in your home with my then boyfriend. How time flies. Hope you are happy and well. Hi Ian and co, greetings from Derry. Just came across this by accident. Great to see that something is being done about it. I’m performing in a play for the Pride Festivals in Derry and Belfast this year, it’s called Galatea. You can get info about it on Sole Purpose website. Great to see all this happening, will be in touch soon. Great to hear from you both again. If you are ever in London make a date to view a much bigger (bloody enormous) collection of material at the Hall-Carpenter archive housed in the London School of Economics library. Sue Donnelly is in charge and I am sure she would be pleased to let you view it all. my email is: dunedin10@yahoo.co.uk. We briefly connected in london a couple of years ago, I remember, and at the time you were in the process of ‘I have a dream…’. It was great to be with Nettie Pollard, (whom Im regularly in touch with), Bill Thorneycroft and John Lloyd at the Veterans Big Parade and be part of the ’tiller girls’ fronting the march – The Veterans Pride and to be holding the banner with them, tho’ I couldnt claim to have been on the first march, but got stuck in pretty soon after! When I made my first tentative, faltering steps into the centre, I particularly remember Auntie Alice’s withering wit, which at first petrified me, but I realised that it was part of his ‘character armour’, or part of what made him who he was. Vive La difference! Ive also see Edwin Henshaw a couple of times over the years. Hi, I’m wondering, who were people of color involved in the Brixton Faeries, GLF? 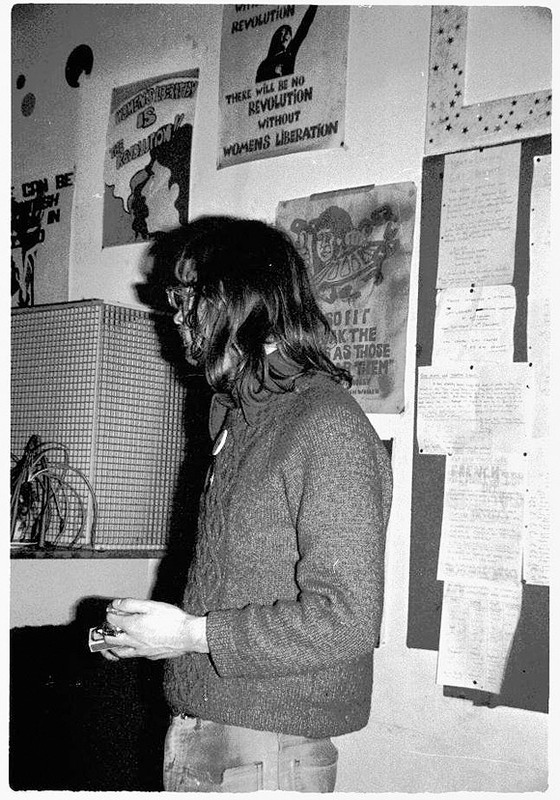 Also, were there any points of convergence, coalition and/or tension btw the Brixton Faeries, GLF and the Brixton Panthers, especially since Olive Morris did squatter activism? 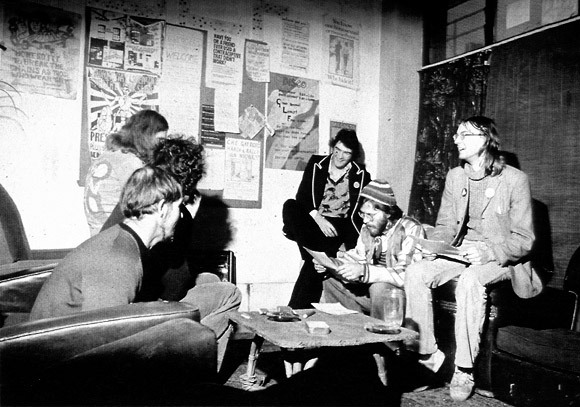 Finally, I read that the two founders of the GLF in London actually established (however informal) the collective after being at the Black Panther’s Convention in Philadelphia in 1970 (where third world gay liberationists like Ortez Alderson and Kiyoshi Kuromiya participated and drafted an anti-imperialist, anti-racist and anti-capitalist movement platform). Thanks! fairiedreams: I can only speak for Brixton Faeries and the largely gay men’s squats in Brixton. As far as my memory serves me the Race Today collective was situated just around the corner from the Railton Road gay squats also in squatted buildings in Brixton. Shakespeare Road I believe. Darcus Howe and Linton Kwesi Johnson were both part of the group (I think). Both of them black radical activists and I believe involved in the black panther movement. Given the politics of the time a lot of groups were separatist and in many ways distrustful of each other. I’d like to say we acted in solidarity with each others political aspirations but we didn’t. Having said that there were several black gay men living at the squats and involved in the gay community centre. Many of the people were involved in and on Nighthawks and more so in and on Strip Jack Naked: Nighthawks 2. Some loved the films, some did not! Both films on the BFI double DVD. I am currently setting up the Paul Hallam Archive at the Bishopsgate Institute in London. I have deposited some copies of the alternative mag. Gay Noise. Many were involved in its short-lived but exciting run! I’m writing a PhD and want to speak to LGBQ people in the Brixton area about what it is like to live here, and how things have changed/are changing in response to gay rights and also local gentrification. I have scanned a photo of Julian Hows in his London transport protest skirt (clipped from the paper) and would be happy to post if there were interest and if I knew how. I remember staying for a few days at the Railton Road squats in the Summer of ’81. I remember around this time meeting Dirg, Terry S., and Jamie D., among others. I also remember going over from London with a group (including Colin G. And Davy M.) on the Troops Out delegation to the anti-internment march on the Falls Road in West Belfast on August 8 in support of the H-block/Armagh hunger strikers. We had two gay banners on the March – Irish Gays in London and Brixton Gays – the first time that gay banners had ever been carried on a demonstration in Belfast (to my knowledge). Shortly after that march Lesbians and Gays Against H-Block/Armagh was formed, which eventually became Gays Against Imperialism after the end of the hunger strike. 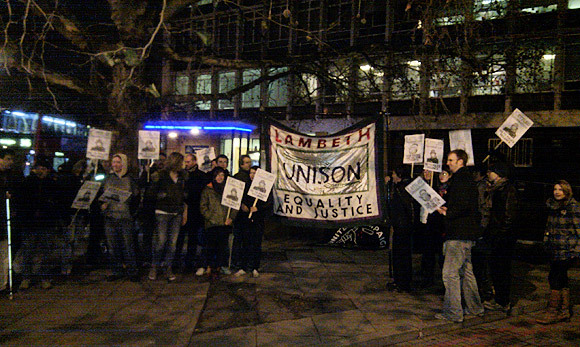 I have some photos of the march with the Brixton Gays banner. I’ll try to dig them out and post them. Paul, in the third photograph (‘Kitchen of 152 Mayall Road’), may be a Paul Venter or Vetter. I was in Deptford Market this morning and found a box of photographs and notes from what appeared to be the early- to mid-1970s, belonging to some unknown person (presumably male) from Bromley, Kent. One of the undated notes contained a name and address, reading, “Mr Paul Vetter/Venter(?) [the handwriting was poor], age 24 years, address 159 Railton Road, Herne Hill, London, S.E.” After which is written, “Gay Community Centre, Railton Road”. This may or may not help you with your research into this fascinating snapshot of Brixton’s past. This would be Peter Vetter who still lives in Brixton! A fascinating read. It is good to see the story being told. I seem to remember that a group of us did a bit of a vaudeville act, complete with excellent pianoforte accompaniment, by a young man with glasses, in the gents loos in front of the Brixton library. but cant remember very much else about it. Did we have an audience? or visits from the police? Im really looking forward going up to LSE next week to have a look at the Hall-Carpenter archives. I just saw an article in one of the gay mags – attitude I think it was about a Felix Alvarez, and I now remember him, as a dark eyed handsome young latino man, and have since looked him up on wikipedia.. Yes, many of us were affected in so many ways and began to say ‘Yes We Can!’. Remember you well, Richard. A kind and nice friend frlm that period. Hi Felix, So nice to contribute to this blog, the first time I have looked at it for several years, Great to be able to be in touch. I have lived in Nottingham with my partner, for around 36 years, whom I met across a crowded campaign meeting at London Friend. Looking back I think my apprenticeship in becoming a feisty youngish political man was honed by soaking up some of the anger and determination I experienced at the Brixton Gay squat. At the time I just looked on in awe for the mostpart, but it helped galvernise my agitprop energy and determination in being part of the solution for change. So When i ran for office as a local labour councillor in Nottingham, in 1983, just after the defeat of Peter Tatchell in Bermondsey, the labour party said I would never be elected if I declared in my election address I had a long-term male partner. I refused to compromise, saying ‘take me as I am, or find someone else’, and I was elected to Nottingham City Council. Not because of anything special that I had done, other than live my truth authentically. Thank you Railton Road Gay Squatters, for helping in my character re-formation. (I recently wrote a short 2000 word article called ‘The Skaters Waltz’ about this experience, as one of ten older LGBT contributors, now living in Nottingham). Thanks so much again, Ian for all your tireless work in initiating this important project. Hello Richard! I know this is a year after your post but thought I’d get in touch anyway..my brother Alastair Kerr was in the original Railton Road squat. He died of Aids in ’86. My brother and I have been collecting memories of him, in part at least, for our own children. Do you have any recollections of him? I know he ran the keyboard for a while. IN 1974 I lived halfway up Tulse Hill at 110, Endymion Road. In the May I remember, on my way to Brixton station, waiting for my local polling station to open. When it did, I went in and voted for the first openly gay local candidate Malcolm Greatbanks, was I the first person to vote for an openly gay candidate? My partner and I also attended one of two of the discos in the crypt of the church near the town hall. Great days for us young gays, in those days, you could still shock the locals, I remember getting my knitting out on the tube, I must admit, only for its shock value, like openly reading “Gay News” on the tube. I remember joining the march in 1972. Dear David, I volunteer with LAGNA [Lesbian & Gay [e]Newsmedia Archive] based at the Bishopsgate Institute – Do you have any archive-kind material you would like to donate? Probably worth noting that many Fairies were also much involved with Brixton Artists Collective at Brixton Art Gallery. 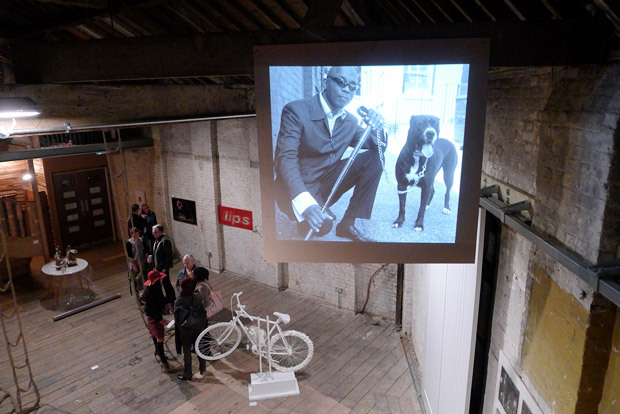 The first open selection national Gay & Lesbian Art exhibition took place there in Sept 1983. An archive about that is in Tate Archive and the Fairies are in the material deposited there. Do you by any chance know people who might remember my brother, Alastair Kerr, who was living at the Railton Road squat? He appears in a number of photos above and is shown ‘answering the phone’ at the Community Centre. I and the rest of his remaining family would very much like to hear more from people who knew him then. Hi Robert. Yes I remember Alastair very well – and very fondly indeed. A man with a very big heart and a great sense of humour. Not to forget his real love of big diamonds. He was a learned and knowledgeable person who nonetheless did not need to impress with his status. And he was sensitive to others, too, detecting shyness and – certainly in my case – making the effort to include. There will be others who will have lived more closely with Alastair in the gay community that grew up in the vicinity of the Centre. But these are my own memories. All of them fond, and of a kind, warm person who rarely failed to inspire or bring a smile. Many thanks, Felix. I’ll forward your comments to the rest of the family. He was living with Rufus (Paul) Gunn in his last years; any news of him? I’m in touch with someone who lived in the group of squats where Alastair was living, and who may have some further info. Will let you know in due course. I might have mentioned this before, but there is some extensive footage of the Brixton groups in Strip Jack Naked: Nighthawks 2 (Ron Peck). Also I have deposited materials at the Bishopsgate Institute archive in London. That sounds like the footage my brother and I, with our respective families, saw for the first time last weekend. It prompted these enquiries. Don’t know about the Bishopsgate Institute – I’ll google for an e-mail address. It is a glorious place. They have a Facebook page and a website, a library and an archive. A big LGBT section too. My archive there is extensive but only preliminary sort into about 260 boxes so far. Stef Dickers is the archivist and librarian, and is immensely friendly and helpful. It is just across from Liverpool Street station. Great. I’ll have a look at the Facebook page and my brother in London can maybe visit. Hi I used to work with Julian at Buggins Bistro in Lordship Lane and went to parties at Mayall Rd. I often wonder what happened to Julian and the other people at the squat. Hi Steve I think I remember you. Did you have long blonde hair and did the washing up? I know that Julian lives in Amsterdam and you can find him on Facebook. He’s very involved in an international organisation ” living with HIV”. I visited Giovanni in about 1976 when he lived in Reggio Emilia. Sean died in 1985 and I think a lot of people did from those days. I live in East Sussex . 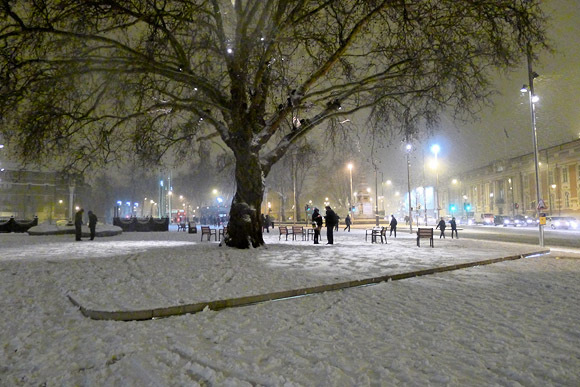 It was good fun all those years ago….Lordship Lane has changed quite a bit.